Globe Prepaid launches On The List, an exclusive community of customers who will enjoy leveled up event perks. First dibs promos, ticket giveaways and other surprises await members! Pre-qualified customers will receive a text inviting them to sign up for On The List. First 320 members to text “FIRSTDIBS” will surely have first access to the pre-sale and immediately receive a unique code. They can then purchase their tickets at SMTickets.com or any SM Tickets outlet with this unique code on December 5! Not part of On The List? Don’t worry, you can still get a chance to score first dibs on BLACKPINK tickets with the #GlobeKPOP BLACKPINK First Dibs Raffle Promo! From November 29 to December 3, 2018, just register to GoSURF 999 and validate your entry by texting BPREG <space> <Name/Address/Birthyear> to 2346. Lucky customers to register will get a chance to get a unique promo code which they can use to purchase their tickets on SMTickets.com or any SM Tickets outlet on December 5! BLACKPINK’s Manila stop is part of the Korean girl group’s 2019 world tour, which also includes Bangkok, Singapore, and Hong Kong. BLACKPINK is the highest-charting female K-pop act on the Billboard Hot 100. They are the first and only K-pop girl group to enter and top Billboard's Emerging Artists chart. They are also the first female K-pop group to have four number-one singles on Billboard's World Digital Song Sales chart. Most recently, Globe Prepaid brought huge acts such as EXO, Super Junior, and Wanna One to the country to satisfy Filipinos’ K-Pop cravings. With exclusiveBLACKPINK pre-sale promos, Globe Prepaid continues to strengthen this commitment to bringing the best in K-Pop and world-class entertainment closer to Filpinos. 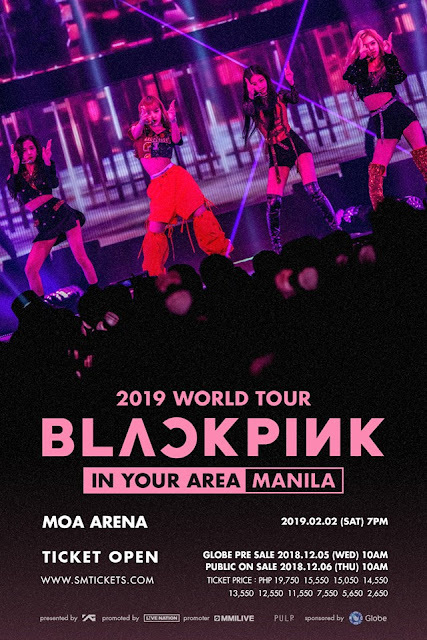 For more information, visit globe.com.ph/go/events/blackpink or follow Globe on Facebook and Twitter.